My apologies for the late post. As you will see, events conspired against me in trying to get this post out. Our second day of program turned out to be quite an adventure. After breakfast we loaded aboard the van and returned to the Nantahala Outdoor Center. Soon we found ourselves standing next to a mosquito-infested marsh as we geared up in full body harnesses and helmets to attack a variety of aerial obstacles. Trey, Joe, and Nick brush away the mosquitoes as they wait for the helmets to be issued. Wes is ready to go as well. 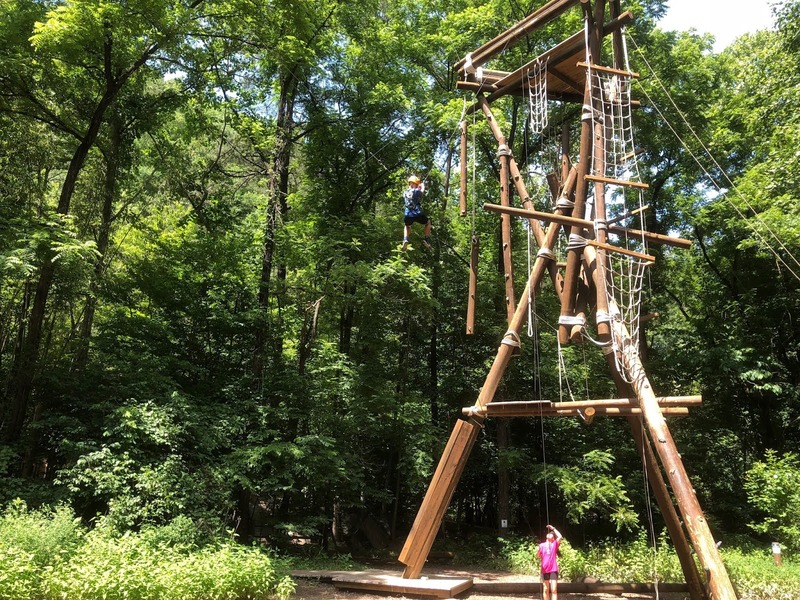 The adventure course consisted of several elements connected to a 50 foot wooden tower. There were two sky walks where participants followed a path across a series of elements. 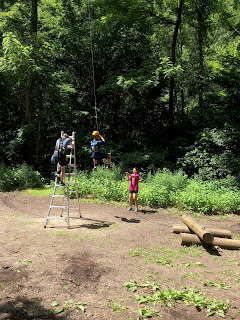 We balanced on ropes, steps, and logs as we made our way across the course. 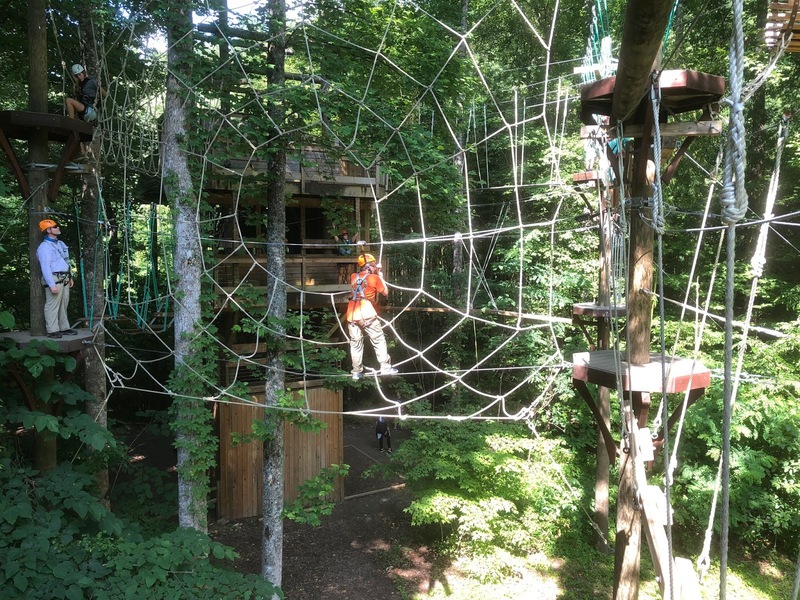 In one place, a giant spider web made of ropes was shared across the upper and lower levels. Everyone made severals trips through both routes during the two hours of our scheduled time. Joe crosses the lower side of the spider web. 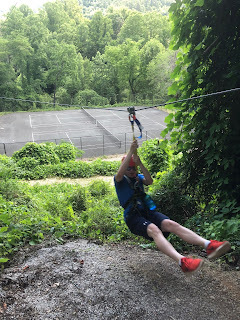 A zip line stretched across the road, starting up the hill next to the NOC tennis courts and ending at the top of the tower. We also made multiple runs down the line during our time on the course. Nick takes flight at the beginning of the zip line. Three rock wall routes snaked up the side of the 50 foot tower. They were divided into beginner, intermediate, and advanced routes. Nick, Joe, Trey, Hunter, and the scoutmaster worked their way up each of the walls and most made it to the top after some encouragement from the assembled masses. 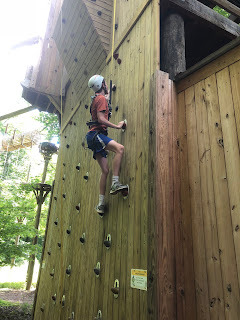 Trey begins an ultimately successful climb to the top of the wall. After a lunch break spent beside the river, during which Mr. Williams discovered a nice set of relaxing chairs, we were on to the next challenge. The afternoon was spent on the alpine tower next to the same mosquito marsh. The alpine tower was made of logs set as a giant tripod with another upside-down tripod attached at the top. It made the structure resemble a giant hourglass. There were three climbing routes to the top that ranked from easiest to hardest. Each route contained different handholds, rope ladders, and steps. The hardest route contained a giant's ladder consisting of 4x4 timbers set as the rungs about five feet apart. Several of the scouts and the scoutmaster successfully made it to the top on the easier routes but no one was able to conquer the giant's ladder on the hardest route. 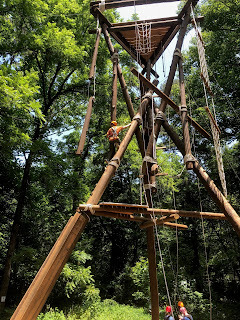 Joe pauses about halfway up the tower. The final element of the day was called the "swing by choice." This consisted of a cable hanging about twelve feet above the ground. 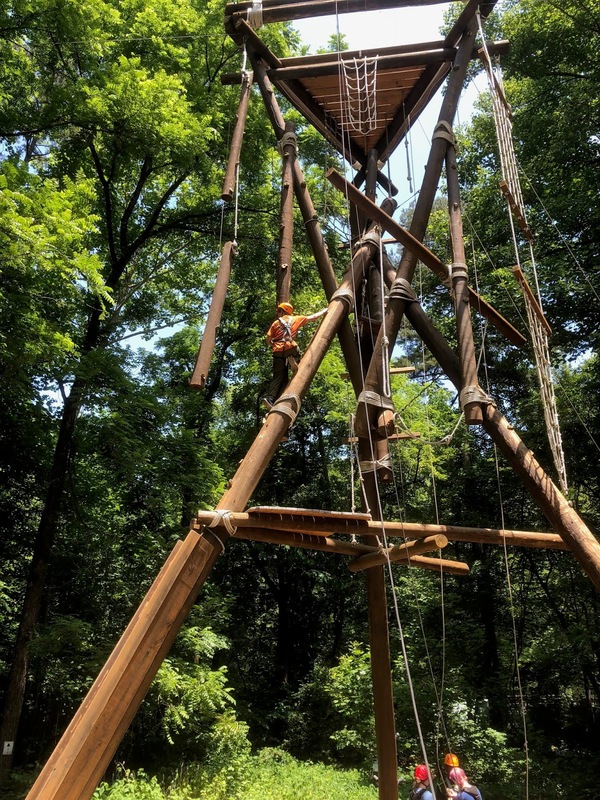 A participant climbed a ladder and was hooked into the cable. A rope was then looped through the harness for the participant to hold in place. The end of the rope was then taken up by the rest of the crew and used to pull the participant upwards towards the side of the tower. 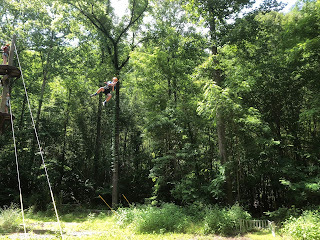 The participant then had to release the loop of rope and allow himself to swing downward through about a 50 foot arc. The element combines the fearful sensation of falling with that of flying like Spiderman as you swing back and forth across the arc. 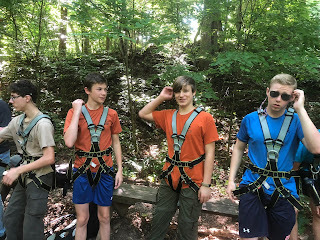 Hunter, Joe, and the scoutmaster were the only Troop 50 scouts who were willing to give it a try but each of us did it multiple times. Hunter is hooked into the cable and is ready to be pulled upward. The other participants pull Hunter up. Now he is ready to release his grip on the rope. He swings through the air like Spiderman. Unfortunately, the event that put a damper on everyone's willingness to participate was an accident that occurred on the alpine tower. As one of the other Zip and Splash participants (from another troop) was being lowered off the tower, the NOC staff member who was belaying him lost control of the rope and the scout fell the last ten feet to the ground spraining his ankle. The NOC medical staff checked the scout on the scene but he was then taken to a local urgent care facility by the Camp Daniel Boone van, accompanied by the camp staff member and Mr. Williams. The scout was not seriously hurt but the accident has likely halted his participation in the program for the remainder of this week. 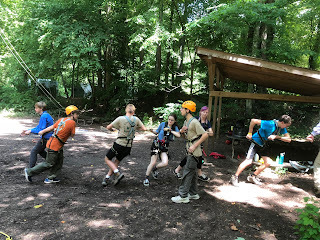 The incident put us behind schedule for returning to camp and also necessitated the writing of incident reports by Mr. Williams and me as witnesses to the accident. 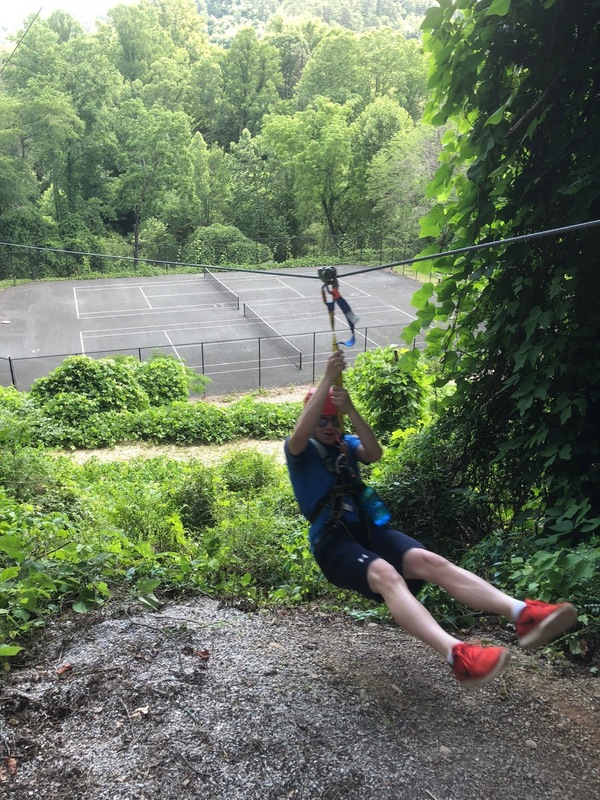 We are heading back to the NOC this morning to do the mountaintop zip line course. 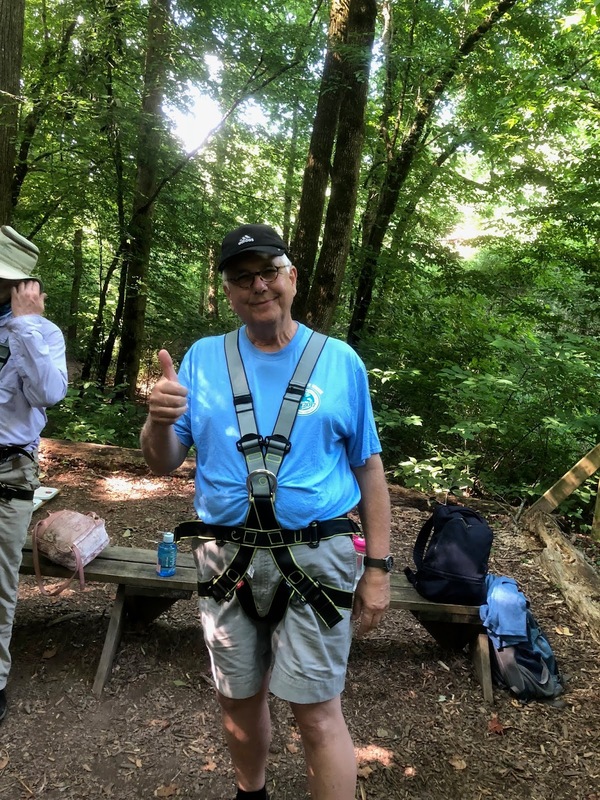 While we understand that accidents can happen, we intend to keep a closer eye on the scouts and the staff while we are zipping through the mountains. The online photo gallery is now activated. All of the photos from the troop at Camp Daniel Boone and the Zip and Splash program are grouped by days. Sunday's photos are found at this link and Monday's are here. Photos from Tuesday are found at this link. Tweets are also rolling to the troop Facebook page.